Most states with nuclear weapons maintain policies that would permit their first use in a conflict. Pledges to only use these weapons in retaliation for a nuclear attack—or a no-first-use (NFU) policy—are rare. Where these pledges have been made by nuclear states, their adversaries generally consider them not credible. 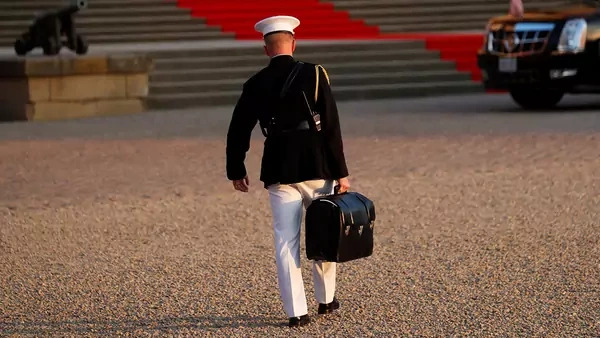 Strategic planners for nuclear weapons powers see the credible threat of the first use of nuclear weapons as a powerful deterrent against a range of significant nonnuclear threats, including major conventional, chemical, and biological attacks, as well as cyberattacks. Even states with significant conventional military forces, such as the United States, consider it necessary to retain nuclear first use as an option. The 2018 Nuclear Posture Review, under the administration of President Donald J. Trump, retains the option of nuclear first use. What is an NFU pledge? A so-called NFU pledge, first publicly made by China in 1964, refers to any authoritative statement by a nuclear weapon state to never be the first to use these weapons in a conflict, reserving them strictly to retaliate in the aftermath of a nuclear attack against its territory or military personnel. These pledges are a component of nuclear declaratory policies. As such, there can be no diplomatic arrangement to verify or enforce a declaratory NFU pledge, and such pledges alone do not affect capabilities. States with such pledges would be technically able to still use nuclear weapons first in a conflict, and their adversaries have generally not trusted NFU assurances. Today, China is the only nuclear weapon state to maintain an unconditional NFU pledge. States with such pledges would be technically able to still use nuclear weapons first in a conflict. What is the U.S. declaratory nuclear use policy? During the Cold War and even today, the credible threat of the United States using its nuclear weapons first against an adversary has been an important component of reassuring allies. At the height of the Cold War, the threat of U.S. tactical nuclear use was conceived of as a critical bulwark against a conventional Soviet offensive through the Fulda Gap, a strategically significant lowland corridor in Germany that would allow Warsaw Pact forces to enter Western Europe. A nuclear first-use policy was thought to be a cornerstone of the defensive posture of the North Atlantic Treaty Organization (NATO), given the large number of bases of Warsaw Pact conventional military forces. Accordingly, NATO has always opposed a U.S. NFU declaration and has never ruled out U.S. first use under its “flexible response” posture since 1967. Today, U.S. allies in East Asia and Europe alike rely on credible commitments from the United States to use nuclear weapons first to deter major nonnuclear threats against them. The United States has considered but has never declared an NFU policy. The United States has considered but has never declared an NFU policy and remains the only country to have ever used nuclear weapons in war—twice against Japan, in 1945. The Trump administration’s 2018 Nuclear Posture Review expands the range of significant nonnuclear strategic scenarios in which the United States may contemplate nuclear weapons use. Notably, it does not rule out the first use of nuclear weapons in response to cyberattacks. The 2010 Nuclear Posture Review, under the administration of President Barack Obama, reiterated an assurance in place since 1978 that the United States would not use nuclear weapons against compliant members of the Nuclear Nonproliferation Treaty (NPT). The Obama administration still maintained the option to use nuclear weapons first while stating that the role of these weapons to deter and respond to nonnuclear attacks had declined and that it would continue to reduce that role. It additionally emphasized that the “fundamental” role of U.S. nuclear weapons was to deter nuclear use against the United States and its allies. In 2002, during the administration of President George W. Bush, the classified Nuclear Posture Review emphasized the role of U.S. nuclear weapons in deterring nonnuclear threats, including weapons of mass destruction (WMD) and large conventional military forces, ostensibly through nuclear first use. What is the debate in the United States on NFU? Though the 2010 Nuclear Posture Review did not include an NFU pledge, the Obama administration considered the idea during its second term. It ultimately left U.S. nuclear declaratory policy unchanged from its 2010 iteration, which stated that the United States reserved the right to use nuclear weapons to deter nonnuclear attacks while strengthening conventional capabilities to gradually reduce the role of nuclear weapons to that of solely deterring nuclear attacks. Nevertheless, the Obama administration’s final year in office saw animated debate among proponents and opponents of an NFU declaration. Arguments in favor of a U.S. NFU pledge. Proponents of a U.S. NFU declaration have argued that not only does the United States already maintain a de facto NFU policy but that U.S. superiority in conventional weapons is sufficient to deter significant nuclear, biological, chemical, and conventional threats. Additionally, as Kingston Reif of the Arms Control Association has argued, “a clear U.S. no-first-use policy would reduce the risk of Russian or Chinese nuclear miscalculation during a crisis by alleviating concerns about a devastating U.S. nuclear first-strike.” In nuclear strategy, a first strike refers to a nuclear attack that seeks to disarm a nuclear-armed enemy before it can employ its weapons. Other proponents pointed to an NFU policy declaration being a necessary step on the road to global nuclear disarmament, an aspirational goal of the Obama administration and a requirement for all recognized nuclear weapon states under Article VI of the NPT. Proponents also argue that U.S. resistance to an NFU declaration has harmed U.S. nonproliferation efforts. Arguments against a U.S. NFU pledge. 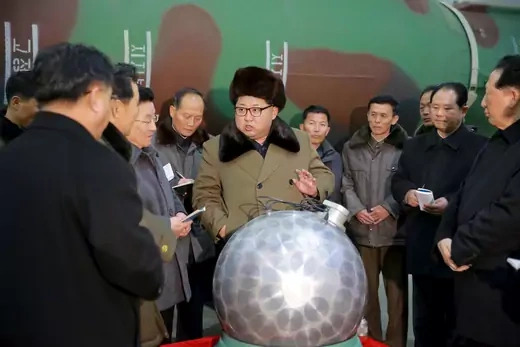 Critics, meanwhile, have suggested that U.S. allies in East Asia and Europe alike would not accept a unilateral U.S. NFU declaration, because it could encourage adversaries to attack with conventional weapons or to use chemical, biological, or cyber weapons. Russian conventional military advantages over U.S. allies in Europe have amplified these concerns. Critics argue that such a declaration could undercut allied commitments and encourage U.S. allies to develop their own nuclear weapons. Within the Obama administration in 2016, Secretary of State John Kerry, Secretary of Defense Ash Carter, and Secretary of Energy Ernest Moniz opposed an NFU declaration, primarily along these lines. These officials shared the view of NFU skeptics that a U.S. declaration would embolden adversaries, weaken allied commitments, and invite brinkmanship. How does the president’s authority to use nuclear weapons relate to questions of first use? Since the Trump administration’s inauguration, the issue of presidential launch authorization has been of interest to lawmakers, precipitated by the president’s calls to expand the U.S. arsenal and threats against North Korea. In 2017, for the first time in forty-one years, the Senate Foreign Relations Committee held a hearing on the president’s ability to use nuclear weapons. Also in 2017, Representative Ted W. Lieu of California and Senator Edward J. Markey of Massachusetts, both Democrats, introduced bills to restrict the first use of nuclear weapons by the president without a congressional declaration of war, but some experts say this would not have meaningful effect on Trump’s ability to use nuclear weapons first. What are the nuclear use policies of other nuclear weapon states? Today, eight states acknowledge that nuclear weapons play a role in their national defense policies. 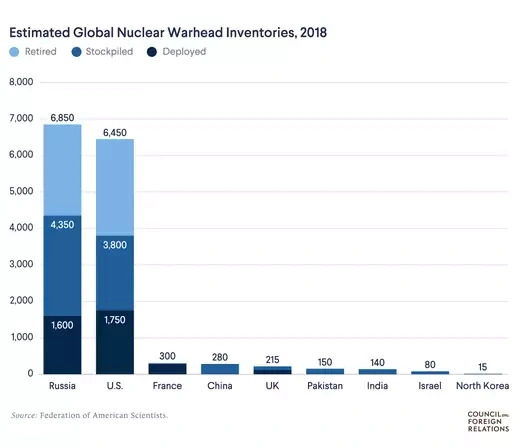 Each of these states—China, France, India, North Korea, Pakistan, Russia, the United Kingdom, and the United States—has conveyed through official statements and documents a certain declaratory nuclear policy, detailing the conditions under which they might use these weapons. Another state, Israel, has not publicly acknowledged that it possesses nuclear weapons but is widely considered a nuclear state. Russia. In 1993, Russia released a military doctrine that formally abandoned a 1982 pledge by Soviet leader Leonid Brezhnev not to use nuclear weapons first in a conflict. This pledge was never seen as credible by NATO leaders in the final years of the Cold War. A French diplomat, writing in 1999, observed [PDF] that even after Brezhnev’s declaration, “military records of the Warsaw Pact that fell into German hands demonstrated beyond doubt that Russian operational plans called for the use of nuclear and chemical weapons in Germany at the onset of hostilities, even if NATO forces were using only conventional weapons.” The 1993 military doctrine said that the country’s nuclear weapons would never be used against nonnuclear states that were members of the NPT, except those that were allied with a nuclear state. 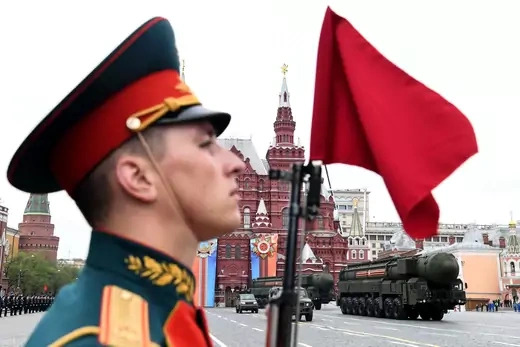 Today, Russian’s military doctrine says [PDF] the country will use nuclear weapons against attacks by conventional forces that represent an existential threat to the country or in retaliation for a nuclear or WMD attack. China. Under stated Chinese posture, the country would expect to first absorb a nuclear attack before using its own nuclear forces to retaliate. While this has held constant since China’s first nuclear test, there is a debate today in the country over the continuing advisability of an NFU posture. For decades, China sought to make its NFU pledge appear credible by separating its ballistic missile and warhead units; under these circumstances, China’s intention to use nuclear weapons before first suffering a nuclear attack would ostensibly be easily detectable. So far, there have been no public caveats to China’s NFU policy, but some U.S. and Indian strategists doubt the credibility of China’s pledge. China has been able to maintain its NFU pledge because it has invested so heavily in conventional military modernization, making it unlikely that it would consider nuclear escalation in a conventional war. China has publicly called on nuclear weapon states to create and join a multilateral NFU treaty—what it has called [PDF] a Treaty on Mutual No-First-Use of Nuclear Weapons. UK. The country maintains an ambiguous nuclear posture that does “not rule in or out the first use of nuclear weapons,” according to the UK Ministry of Defense’s 2010–2015 policy paper on the country’s nuclear deterrent. In 1978 and 1995, the UK reiterated a commitment to not use nuclear weapons against nonnuclear states in the NPT. France. France has maintained a first-use nuclear posture since it first developed and tested nuclear weapons during the Cold War. France’s posture emerged from its Cold War–era fears of abandonment by the United States, which led to the country’s withdrawal from NATO in 1966 to pursue an independent nuclear capability, giving France the sovereign ability to determine how and when it would use its nuclear weapons. France pioneered the concept of a prestrategic strike for a conventional invasion, threatening limited nuclear first use as a way to signal that it was contemplating escalation to the strategic nuclear level. France rejoined NATO in 2009 but kept its nuclear forces outside of NATO’s defense coordination mechanisms. French forces today have inherited that legacy of independence and maintain a first-use posture to deter any type of attack on or invasion of France. India. India maintains a declared NFU posture, with exceptions for chemical and biological weapons attacks. In its 1999 draft nuclear doctrine, India announced that it “will not be the first to initiate a nuclear strike, but will respond with punitive retaliation should deterrence fail.” The public summary of India’s final nuclear doctrine, released in 2003, says that “in the event of a major attack against India, or Indian forces anywhere, by biological or chemical weapons, India will retain the option of retaliating with nuclear weapons.” Indian public statements on nuclear weapons continue to emphasize the NFU policy, without acknowledging the exceptions carved out explicitly in the official doctrine. Pakistan. Pakistan has not ruled out nuclear first use to deter what it sees as an overwhelming Indian quantitative advantage in conventional forces. Islamabad has left the exact threshold for its nuclear use ambiguous. Pakistani officials and strategists have been consistent in their support of a first-use posture, with the exception of former President Asif Ali Zardari, who voiced support for an NFU posture early in his term, in 2008. Today, there is no serious push in Pakistan to reconsider the country’s first-use posture. North Korea. North Korea has not ruled out nuclear first use to deter a preemptive strike or invasion by the United States and its allies. If the country were to detect an imminent U.S. or allied attack, it would use nuclear weapons on military installations in East Asia and in Guam. North Korea’s intercontinental-range ballistic missiles would not be used first but would deter retaliatory nuclear use or an invasion by the United States against its territory. The exception to this might be a scenario in which North Korea fears a first strike by the United States to eliminate the country’s leadership.